Ideally you should use filtered rainwater, but if the tap water of your area is safe to drink you can as well use it for germination purposes. The amount of chlorine added to the water kills bacteria and impurities in the water, helping reducing the risk of infection. If the level of chlorine is too high it will slow the germination process but it will not kill the seedling. If the local tap water supply is not safe to drink then do not use it to germinate seeds. Bottled water, without additives or gas, is a good source of water for germination. For best results, fill a glass with clean water at a temperature between 18 and 25 degrees C (room temperature). IF YOU GERMINATE COLOR-COATED SEEDS, MAKE SURE TO USE A SEPARATE GLASS FOR EACH COLOR. Water slowly dissolves the color-coating, making the different strains unrecognizable. Drop the seeds into the water. The seeds should be left to soak in a dark place at a temperature between 20 and 25 degrees C / 67 - 78 degrees F. A drawer in your kitchen, away from heat sources like an oven, is usually suitable. Check the seeds after 5-10 minutes and tap down the ones that are floating. If they continue to float just let them. 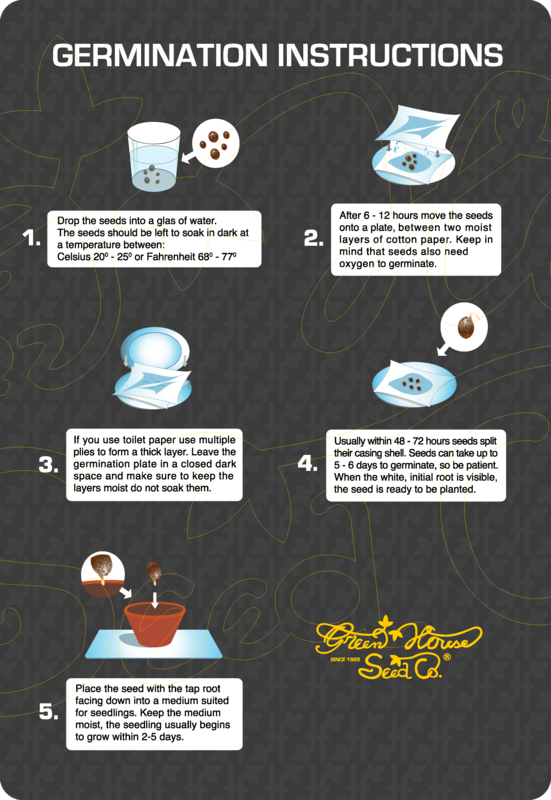 After 8-12 hours move the seeds onto a plate, between two damp layers of cotton or toilet paper. If you use toilet paper use multiple plies to form a thick layer. Leave the germination plate in a closed dark space (the same drawer would be fine) and make sure to keep the layers moist by dripping some water every 6-12 hours. Do not soak them, just keep them damp. Usually within 48-72 hours the seeds swell and split their casing shell. Seeds can take up to 5-6 days to germinate, so be patient. 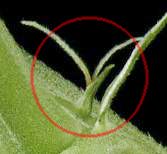 When the white, initial root is visible at the crack in the seed casings the seed is ready to be planted. Soaking the seed after the root is exposed can result in early root damage. Plant the seeds in a clean, pH balanced medium (5.5-6.0). Point the tip of the root downwards. The medium should be loose and light with very good drainage. We suggest a blend of good quality soil and perlite, or rockwool. Cannabis seeds should be planted 2-5 mm deep, using containers at least 10 cm. deep to allow the initial tap root to grow straight down. CHOOSE SOIL FOR BEST FLAVOUR AND HYDROPONICS FOR MAXIMUM YIELD AND RESIN PRODUCTION. The container should have drainage holes to prevent drowning the seeding. The medium should be thoroughly wet, but not soaked. High humidity is essential to good germination rates. Keep the planted seeds covered with clear plastic to create a humid and protected environment, or keep them moist with a sprayer every few hours. Place the planted seeds under horticultural lights or a cold white neon tube in a warm humid environment (20 - 25 degrees C / 67 - 78 degrees F). After a few days the seedlings can be exposed to HPS or MH grow lights, or to sunlight.Slowly and gradually get the seedlings used to the light/sun, avoid overheating. After a few days the young plant will be strong enough to take full light/sun and boost. GREEN HOUSE SEED COMPANY GUARANTEES THE VIABILITY OF ALL ITS SEEDS. IN THE UNLIKELY EVENT THAT YOU HAVE A PROBLEM WITH GERMINATION, TAKE PICTURES OF THE GERMINATION PROCESS AND KEEP THE SEEDS AND THE PACK, AS WELL AS PROOF OF PURCHASE. THEN USE THE CONTACT FORM ON OUR WEBSITE AND WE WILL PROVIDE YOU WITH ASSISTANCE TO GET A REPLACEMENT, FREE OF CHARGE. 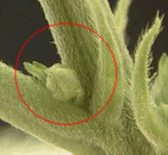 Female plants can be detected at an early stage (2-3 weeks into the 18hrs growing period) as they develop the so called pre-flowers, located on the main stem, under the branches, at each internode. 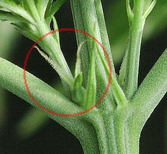 A female pre-flower looks like a single green pocket with two white hairs reaching out. 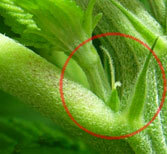 Male flowers do not have white hairs sticking out and form clusters of green balls that contain pollen.